While I was baking Wacky cakes as a child, French children were learning to bake this elegant cake! According to Clothilde, from Chocolate & Zucchini, this is the first cake a French child learns to bake. 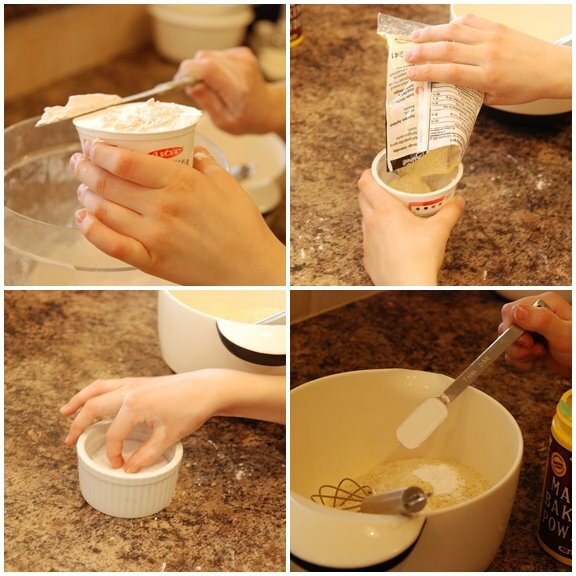 Most of the measuring uses the handy yogurt tub (which is approximately a ½ cup), and you can see a rendition of this cake with this type of measuring on Clothilde's blog. "Remember that all good cooks clean up after themselves." I don't know why this stuck in my head, but I've even heard myself telling my children the same thing. I think it's a desperate plea not to be the one left to clean up all the flour and sugar spills that are inevitable after baking with children, and now that I'm a mom I'm glad Angela Burdick included this sage piece of advice. I decided it was time my children learned to make French Yogurt Cake to complement their Wacky Cake and Chocolate Chip Cookie repertoire. So they each took a turn preparing a part of this recipe. And we tried using the one-yogurt-tub form of measurement too. Yogurt is more abundant in France. David Lebovitz did a post in 2005 about the yogurt at his local grocery store. Heck, leave the yogurt out of it…I want one of those beautiful containers. Carol Gillott from Paris Breakfasts painted the yogurt container and uses them to hold water for her watercolors. This cake relies on the flavor of the oil. In fact, you should taste the oil before using it in this cake (if only to make sure it hasn't gone rancid). 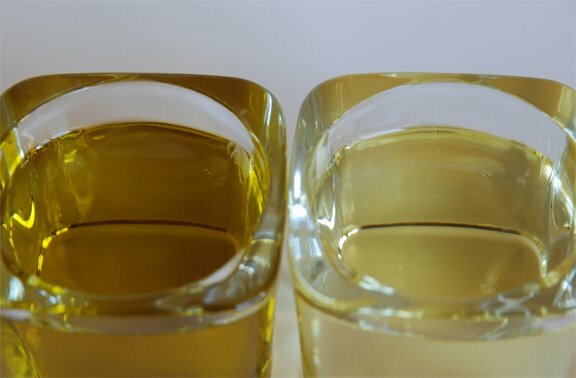 I tried using both Extra-Virgin Olive Oil (EVO) and vegetable oil. 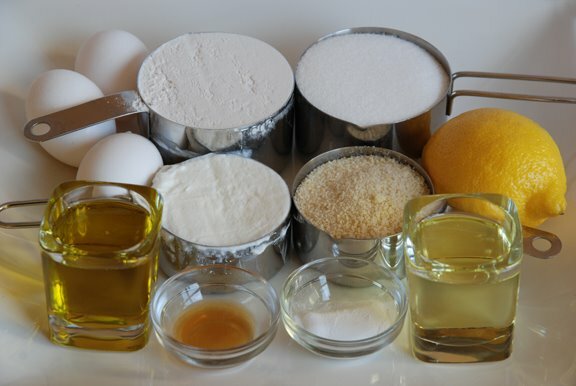 Although the olive oil is fruity and nice to use in cooking, we didn't like it in this cake. Its flavor was too prominent and overshadowed the delicate lemon flavor. We loved the vegetable oil version much better. However, don't let me stop you from trying it yourself. Here's a link to Dorie's version on Serious Eats that uses EVO. As for the marmalade drizzle, you can read all about my Seville Orange Marmalade in my previous post. After a bit of digging, I found some adorable posters that help French children make this cake. 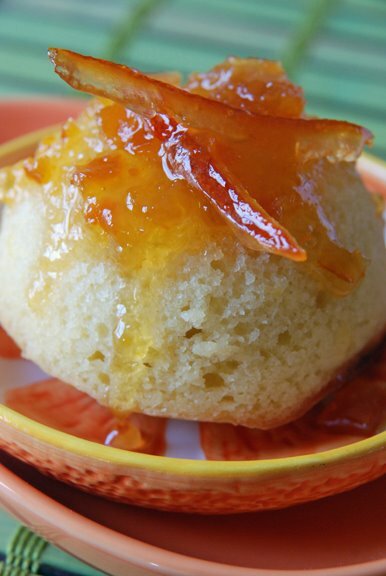 You can find the recipe for French Yogurt Cake with Marmalade Glaze in the book Baking: From My Home to Yours by Dorie Greenspan or here. To see how the rest of the TWD group fared with this week's recipe, click here and then click on each blogger! Thanks to Liliana from My Cookbook Addiction who chose the recipe for this week. 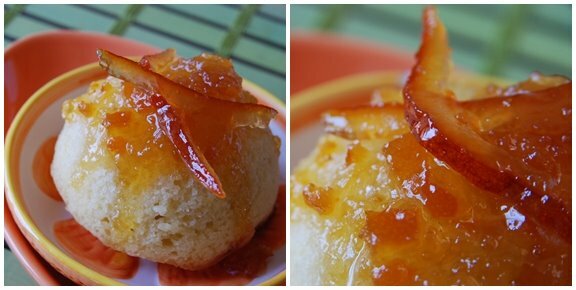 The light lemon flavor in this tender and moist cake was delicious on its own, but drizzled with the marmalade made it that much more tasty. Two of my kids liked it on its own, but the third ate a chocolate chip cookie instead. Two out of three isn't bad. Blueberry Crumb Cake on pages 224-225 chosen by Sihan of Befuddlement. Buy a container of yogurt in France just to keep the container. What a neat recipe. I love seeing the children get involved. My son just asked me the other day if he could bake with me sometime soon! Gotta love that! The containers look so pretty! I'll remember that tip =) The cake looks so light and fluffy, wonderful flavours too. I love that you used the rinds in the marmalade as a garnish...I couldn't bear to discard them! I also love (and share!) your childrens' baking repertoire. Wacky cake is one of my standbys, and this will join it! Shari, I just had to come back and thank you for introducing me to Paris Breakfasts...and I'm ordering that poster! 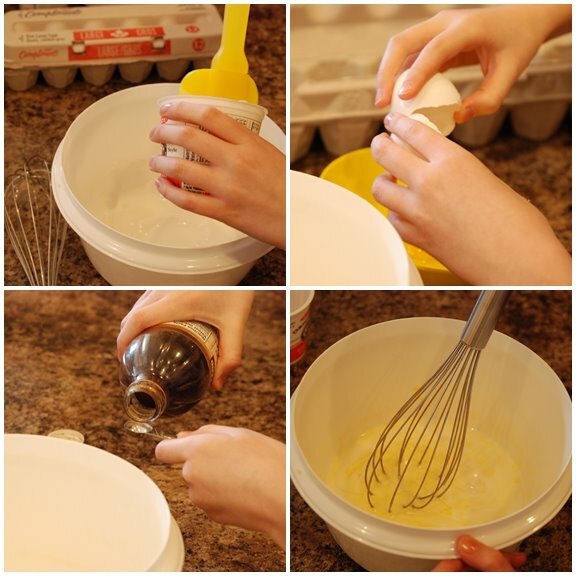 What a great recipe to get kids started on baking! I'm bookmarking so I can add it to my list! How great that the kids did this! I LOVED this cake, it smelled so good while cooking and tasted wonderful :) I paired it with simple lemon curd. YUM! I really liked this cake and loved that there are so many variations. Wow, thanks for all the additional info. I want one of those posters! It's great to share a classic cultural experience with your kids,especially if you get to eat the results. It is just gorgeous!!! I love your little helpers! It makes me so happy to see children learning about great things like this. Very cool, lady. Very cool. Helpers. Oh how I wish I had some. Mine just opens the oven drawer, empties it of the contents, and proceeds to sit in it. Great job again this week! Wow...lovely looking cakes. And, most of all, I love the little hands, so those photos are so precious...into the scrapbook they go, right? Very fun to see and learn and experience this entire recipe through your eyes. Such a great recipe to make with the kids! :) I am definitely using olive oil next time... I love its flavor and I thought the canola wasn't that great. I love all of your photos - so beautiful! Glad you guys had fun baking the cake. This was a great recipe. The marmalade on top looks perfect! Yet another reason to head to Paris-yogurt containers! I just LOVE the little hands in the sugar. So sweet (pun intended)! I think it's wonder the children helped make these. Awwwhhhh I love the helper pictures. Lovely, Shari a.k.a. Shari's children! Your cakes look wonderful. How cool that you involved your children. 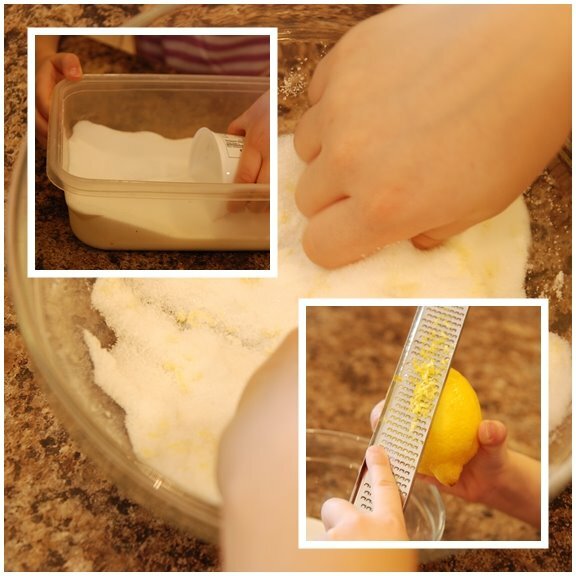 This is a perfect recipe to make with kids...I may need to round up my niece and nephew. What wonderful helpers! My boy got involved as well. Your marmalade is gorgeous. Lovely! 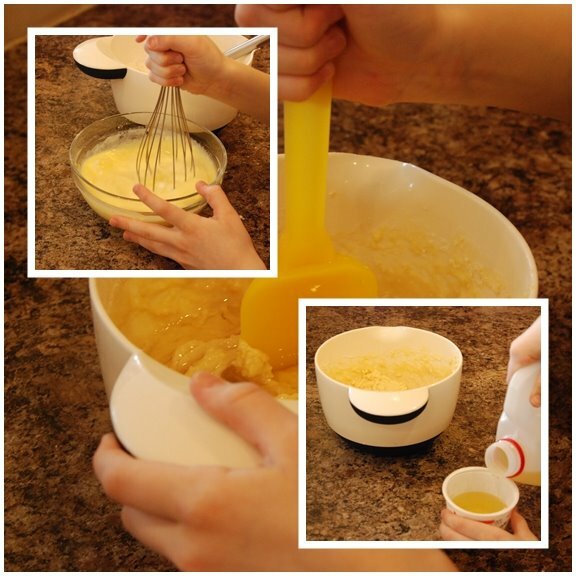 I love a recipe that can get the children involved! Nice to have helpers to cook and eat. I will have to add yogurt containers to my ever expanding list of things to bring back from Paris. Your cake looks wonderful! My six year old likes to help measure but usually wanders off before the baked goods make it into the oven! its great you're getting your kids involved. How fantastic that you got your kids into the action! In this day and age of instant gratification when everything comes already made out of a box, I'm so appreciative when I see people teaching their children the art of home baking. Fantastic job Shari...i love this post! It always good to have an extra set of hands in the kitchen to help with the cleaning up. Yes Mam! As always your posts are amazing as well as the photo which is making me hungry. So yummy. What fabulous helpers you had! They must the reason why this cake looks so darn good! And it does look so good; I'd love a slice right now! Your pictures are fabulous -- love those little helper hands! -- and I love this cake all the more now that I know that it is the first cake French children learn to make. What a great way of encouraging a love of baking early! Your cake looks wonderful -- we loved this one! So cute! I love how you encourage your kids in the kitchen. You have such an amazing site. I am at a loss for words. Awesome job! I love that the kids got involved too. Your marmalade looks incredible! i love yogurt cakes, no matter what country it comes from! everything is gorgeous, as usual! your kids made beautiful cakes--you are a great teacher! and i love those posters. they are too cute! Love the presentation on the cake. I like the longer zests of lemon/orange cause they look pretty. good for you to get the little ones started early. Oh those are just the funniest posters! Love all the background on yogurt cakes too. Lucky you to have helpers :) Beautiful cake! Great post! I love those yogurt containers and posters. Your cake looks delicious! Thanks for stopping by!